Classic Velocity has certainly had the good fortune to enjoy some of the most celebrated motorcycle marques at shows and Councourses in all their restored glory. We have also been able to enjoy preserved versions where good fortune and very good care have combined to provide an authentic glimpse back in time. And even beyond this, we have seen competition machines that ooze history from every patinaed surface and seal. We love them all. With that said, there is something even more awe-inspiring about a vintage machine that has gone without restoration or extensive preservation beyond normal maintenance. These are the true testament to the machines themselves and to the quality and craftmanship and engineering of their construction which took place many decades ago. This is in part why events like the Great Race and the Cannonball hold such appeal. Machines operating as they were intended. It would be a great treat to see any one such machine, but mind boggling to see many in one place. Good News. There is a motorcycle exhibit in which most of the motorcycles are in this state. The Forney Transportation Museum has been covered before as we stumbled upon a Mercedes exhibit (see The Benz Binge). 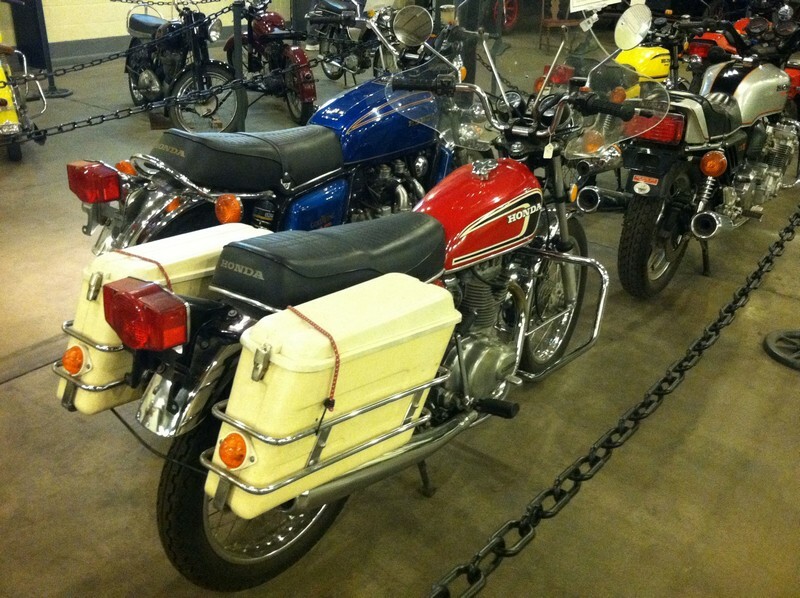 One of the modes of transportation that the museum covers is the Two-wheeled variety. There is a separate hall dedicated mostly to motorcycles and bicycles (another impressive collection). 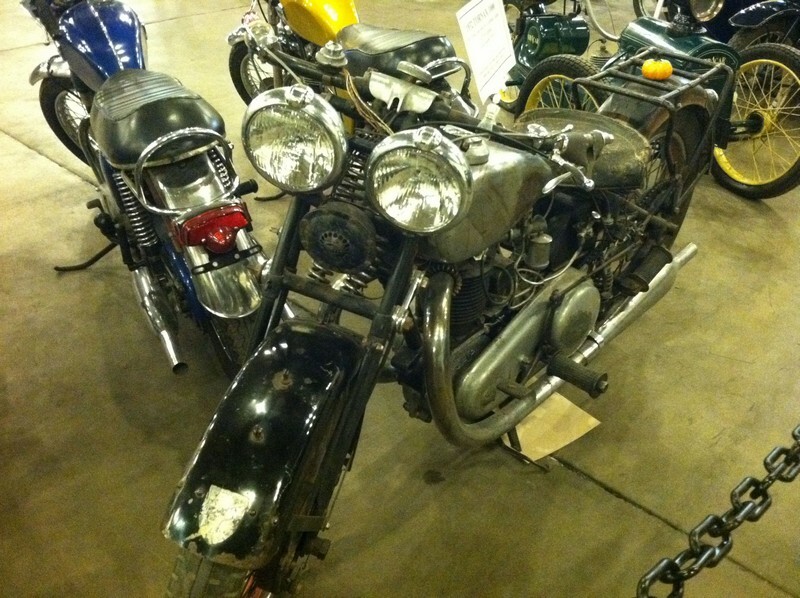 The motorcycle collection is there coutesy of Walter Timme, who became an Indian dealer and racer back in the 1930s. He and his wife Lucille stayed with Indian through the demise of that brand in 1962, but (fortunately) added Honda in 1959, which Timme sells to this day. This history provided a front row seat to the evolution of two brands, and many others flowing through the dealership. It also provided an opportunity to use and secure examples along the way. This has created a collection which is not just a sampling of the ultra rare, but more of a history of transportation as seen through two marques in particular. The collection is arranged so that there is a row of Indians, and a row of Hondas laid out roughly chronologically. I started on the Honda side, which began with a Honda C105T moped and then a 1962 Honda CB92. The machines progressed through the early and mid 1960s with models such as the Honda Dream 305 and the 450 Black Bomber (another bike I never should have sold). These bikes were well worn in most cases, and looked like examples that could be in your garage or mine today. Into the late sixties we went with a 350 Super Sport, and a scrambler. This was the time of the meteoric rise of the CBs and CLs for Honda, and of course the introduction of the game-changing CB750 (never should have sold either of those). In the context of this collection, the CB750 seems like just the natural evolution that is was, and less of a "first superbike". One interesting point was seeing several what we now call "small displacement" bikes such as 200s and 350s fully outfitted for touring with fairings and luggage. We have somehow lost an appreciation for how capable a 350cc 40hp machine really is. Another exotic in the lineup was a CBX which had certainly been well preserved. There is something about those six pipes that make me long to hear the motor, but cringe at the thought of carb adjustments! The timeline continued with a Super Sport 400, More CBs including a Hondamatic, a first generation Goldwing, Honda Hawk, etc. I think that things ended in the early 1980s mostly due to space for the exhibit. The Indian collection had an impressive amount of memorabilia along the adjacent wall. I am sure some of those items must be ultra-collectible as they included tin toys, models, racing jerseys, posters, etc. The bikes were impressive too even though my knowledge of the Indian brand is pretty shallow. 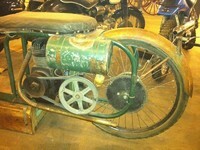 The oldest was a 1913 Indian Twin which was also unrestored, and clearly showed its bicycle roots. there was a 1926 Scout, a 1934 Sport Scout, Walter's very cool 1936 flat track Racer, and a nice Steib sidecar outfit. There were of course a variety of Cheifs with a sampling from every few years of that model with their celebrated valenced fenders. 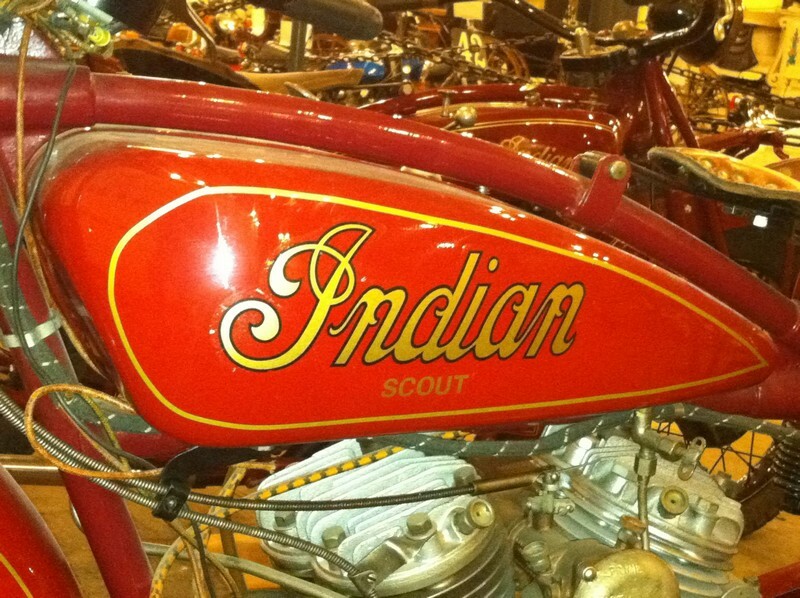 There was even a 1973 Indian scooter (!) from one of the many attempts at reviving the brand. The rest of the exhibit was no less impressive in its originality, and breadth. There were a few BSAs, an Ariel Square Four, and a nice Vincent Rapide looking positively muscular in the company of the other machines. 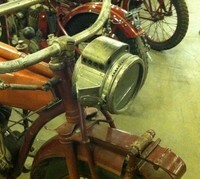 A 250cc Puch, a Neracar, and a 1948 powered bicycle were other interesting items. My favorite though had to be the Tornax 1000, which was built by famous engine maker J.A.P. in 1932. The patina alone on this machine was worth the price of admission, and it was original down to its twin headlights ala today's Triumph Speed Triple. All in all, a wonderful refreshing look at a large number of motorcycles that many of us can and did own. Now when was the last time that you saw lots of freshly oil stained drip pads, and torn and disintegrating handgrips in a high quality museum?